As is always the case with luxury-class accommodations, it's all about connections at the iconic Plaza Hotel in New York City. Presently undergoing a $350 million restoration project, this gem of Central Park South is soon to be as wired as its permanent and part-time residents, who expect nothing less than a prompt and efficient response at the press of a button. 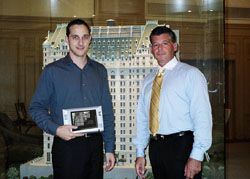 Appointing new residences at The Plaza in New York City with a massive undertaking in MDU systems were Nick DeClemente (left), director of operations and chief system designer of Concierge Direct and Steve Babel, the company's owner. They are seen here with the AMX Modero Concierge Direct custom interface. "The Plaza is one of those few elite landmarks that define what is enduring and best in our great city," explained Miki Naftali, president of Elad Properties, the owner of the Plaza. "We are building on its legacy while setting new standards of quality, luxury, and sophistication. We are also-discretely but completely-overhauling the infrastructure, introducing state of the art systems and technology to assure purchasers, visitors, and guests the highest level of comfort and convenience within the castle on the park." The hotel will celebrate its centenary with the grand opening of a glamorously diverse array of new hotel rooms, condos, and permanent residences-all of which share the same technological backbone and a per-unit infrastructure that exudes customization on a massive commercial scale. A residential project of this nature combines the efficiencies of a typical MDU (multiple dwelling unit) project, where standardized AV systems are rolled out systematically, and the "high touch" attributes of top-end residential systems design. It may seem impossible to appease the idiosyncrasies of every high-net-worth individual who is purchasing a share of a condo or a residential unit at the Plaza while also adhering to a timeline set by numerous construction trades on a project as massive as this one. In fact it's not impossible, but there are few companies set up to deal with a myriad of interior designers and personal assistants while also answering calls from the GC, engineers, and union labor. One of those companies is Concierge Direct, which for more than 20 years has developed customized automation solutions to suit the most specific needs of its very particular clients, which include high-end single family residences and several other notable MDU properties in the New York area. Over the next year and a half, the Concierge Direct team will specify and manage the installation of audiovisual, lighting, and control systems for the Plaza. The process employed on projects of this nature might best be described as "mass customization," a process aided in this case by the fact that a significant portion of those taking ownership of Plaza units are adding them to their scattered "stopover" homes around the world. Sales meetings with these clients, who have a working knowledge of the automation and control systems in their other residences-or boardrooms-are often very brief. "They know what they want," Concierge Direct owner Steve Babel observed. "They tell us where they want it, and at that point they're done and we start work with their designers and architects." At the initial technology meeting in a dedicated sales office at the Plaza, Nick DeClemente, director of operations and chief system designer of Concierge Direct provides a floor plan of the client's unit and together they sketch out loudspeaker, video display, lighting positions, and the touchpanel control docking locations and functions. Once the sketches are complete, Concierge Direct's team of CAD operators generates drawings for approval by architects, designers, engineers, and the various trades on the project. "Because of the pace and scale of the project, it puts an emphasis on getting all the information we need to design a system for that particular client, in our initial meeting. We might not be able to sit down again for four or five months," said DeCelemnte. "The documentation on this project is on a scope and level that's not seen in the residential world," emphasized David Humphries, principal of Thea and Schoen Integrated Systems, a manufacturer's rep firm which handles several of the product lines going into the Plaza and numerous other MDU projects in the New York area. "For example," he continued, "Concierge Direct has been working directly with the architectural firm on the project. Typically when an AV guy works with an architect, he's working on a house. Well here you've got a building, and all of the associated electrical engineering and mechanical aspects. So it's a very complex coordinating effort for the specification community on the commercial side." The integration of amenities and entertainment technology at the Plaza is certainly a project that blurs the line between commercial and residential work. In general, the recent growth in the MDU market is attracting the attention of dealers on both sides, but they will need to consider the careful balance of cash flow, scheduling, and manpower required to be successful in the eyes of so many residential clients-which traditionally require a lot more attention. This is a difficult equation, as Humphries illuminated, as "in the residential world, the companies have the expertise and the product lines to do it, but they don't have the size to handle a commercial-scale project. On the other side of the coin, a commercial AV firm can handle a project of that size but they don't have residential lines." Product selection for a project of this caliber is based not only on elite brand recognition, but also on robustness. "When you do this type of project you really want a product that's going to be reliable over the life of the property, because if there are reliability issues two or three years down the road, the builder or management company may turn around and say they're concerned about any current projects you might be working on with them," noted Richard Stoerger, vice president and COO at ADA, maker of the HTR2400 multi-room audiovisual systems on the Plaza product roster. The astonishing quantities at the Plaza aren't just in the equipment specifications. Manpower is also an advanced science on a project where hundreds of hotel rooms, condos, and residential units are expected to turn around in time for the Plaza's anticipated 2007 grand re-opening. Ask Babel how his 16 staff members are going to make such a large number of elite clientele happy and he'll tell you that the answer is in partnering with union labor. At the Plaza, IBEW Local 3 firms will be assisting the Concierge Direct team from start to finish. Helping to expedite this process is the fact that the AV and lighting systems for the hotel rooms are standardized, as are the systems for the condo units. The residential units will require a more customized approach, but being owned outright by individuals, their timelines differ slightly as well. The brands on the roster at the Plaza include AMX, ADA, Krell, Furman, Meridian, Kaleidescape, Denon, Runco, and Snell Acoustics, just to name a few. Lutron lighting and shade control will be used throughout. Concierge Direct worked with AMX to customize its MDU Amenities Solution, which provides the backbone for the entire facility. On the front end, Concierge Direct's "Lifestyle Amenities" will be offered at the touch of a button on the AMX controllers installed throughout the facility. Concierge Direct will maintain contracts with the Plaza amenities vendors, and discontinue relationships with those which do not perform to pre-set standards. "No one is really doing anything like this at this scale," observed Scott Norder, executive vice president of business development for AMX. "There are a lot of companies out there that are just getting into this MDU business, but by no means is it a standard in the industry. The system will have a programmed chain of command all the way through so that Concierge Direct can make sure that requests are being fulfilled in a timely basis, and if they're not, they can escalate." Of course, system performance is critical, and every precaution will be taken to ensure perfect sound, video, lighting, and control. To keep things running smoothly, Furman's power conditioning, surge protection, and SB-1000 UPS systems will be employed. "In our experience building sophisticated multidwelling units, we have found that power lines often are plagued with RF and EMI noise," said DeClemente of Concierge Direct. "At The Plaza, home theater and audio systems such as televisions, projectors, DVD players, amplifiers, and processors will be fed linearly filtered AC power by Furman's Elite 15 DM system, which reduces noise and ensures consistent peak operation throughout the day, even when power demand throughout the building is at its height." "Concierge Direct's clients at the Plaza are very discerning, and along with the very best technology they also want a system that is maintenance free," said Dave Keller, executive vice president of sales and marketing for Furman. "It would only take one big surge to come through and take all the electronics out. In New York City especially that's something that they're cognizant of, and so they are using a voltage regulator and the battery backup. That way if they do lose power, they won't lose memory or a media server hard drive."